Today’s guest post is by Jon Mize, a yoga teacher based in Vista, CA. Jon and I recently completed our 500-hour yoga teacher training at True Nature School of Yoga in Oceanside, CA. Jon shares my passion for yoga, food, and peace, and he wrote this beautifully eloquent piece after our graduation. I hope you enjoy it as much as I did! I started thinking about my Yoga practice and how it has transformed. It is no longer just an Asana practice. Now don’t get me wrong, that was my door in. I just completed my 500hr. teacher training program with the most beautiful souls one could ever encounter. It struck me, what’s next? Where do I go from here? I took the day off after graduation because my Beautiful wife was out of town and I knew I would have to do all the chores of the past weekend that she could not cover. We do all the chores together, dishes, laundry, grocery shopping, the usual suspects. She was out of town on business and I needed to get things in order for work week. When one of us is busy, the other covers the list. I began to think about what I would cook for dinner, not a big deal; I have some decent cooking skills. I found myself sitting at my end of the couch, no electronics buzzing, just me and the kitties. I began to run down this mental list of the favorite dinners I make, and paused at split pea soup. I began to run down the list of ingredients; split peas, that’s a given, potatoes, fresh dill, fresh oregano, carrots, veggie broth for the base, hmm, sounds good. The intention was set. Now off to the store. I had just a short trip to the store, I could drive there in my sleep, but I was not asleep. No, I found myself fully present for the drive. I found myself fully present when selecting a cart that didn’t wobble or shake. Yea I can’t stand those carts. I walked into the store, quickly got the veggie broth and dried split peas. Headed down the produce isle and that’s when it happened. I saw all the brilliant colors of nature staring at me. Greens, yellows, oranges and browns, reds, pinks, the full spectrum of Spirit/Source was calling out to me. I stopped and lost myself in the smells, citrus, earth, sun. What was going on? Did this store always smell like this? Were the colors always the brilliant? Did they just change the lights and maybe add some kind of produce air freshener? Well I quickly looked around to see if people thought I was insane smelling the air, smiling ear to ear. No one was looking at me. They were all just grabbing and shoving items in their carts, iPhones in hand, lost to the rhythms of nature and source. I began in the herb section looking for my dill. I found the most fragrant neon green dill I had ever seen. I took this bundle and held it up to my nose and took in the flavor thru smell alone, place it in the cart and embraced the remnants on my hand. Next was the oregano, not the tasteless dried jar stuff, no, the fresher the better. I found all of the giant bundles, way too much for my soup. Then in the back I found a small bundle, just a tease compared to the rest, but I saw in this small bundle the perfectly non – perfect leaves of Mother Nature, none were the same, this was the one I needed. I worked my way to the potatoes, there is a small organic section, and I zoned in and started looking. The “baking potatoes” were right next to the organics, these things were huge. As if dwarfing the organics weren’t enough, strangely, they all looked exactly the same. Same size, same shape, no eyes. Yea, a potato with no eyes, not only is this not natural, it runes allot of childhood jokes that immediately came to mind. So back to the organics, there were only about 20 or so in the bin, and they were all knurled and twisted with eyes everywhere, now that’s a potato I thought. Carrots were next, same story, regular bin, cookie cutter carrots all the same size and arranged in a neat semicircle. The organic carrots were in bags with dirt visible in the bottom of it. Yes, this is how carrots should look, they were a dull orange and you just knew they would brighten up as they cooked. I found the rest of my ingredients and had similar experiences with them all. I seemed as though this “quick trip” to the store turned into the longest trip ever. The strange thing was I didn’t care. I was having fun; I was shocked at the comparisons. I was drunk from the smells, and my eyes were wide open to the colors. I got home and arranged all the goodies on the counter and spent some time once again looking and smelling all the vegetables. I wanted to make sure that I didn’t just enter some alternate universe whilst at the store. No, it was the real deal; I managed to pick the best of the best. I stared by adding the beans to water to rinse and soften. I began to peel and chop all my veggies, one by one. I slowed down and watched each cut, each peel; I continued to take in all the colors and all the smells. I looked at how un-perfect each piece of this dish was. I added my broth to the pot, put in all my chopped goodies and herbs, watched the liquid come to a boil and dance. Turning down the heat I decided to sit in meditation while the soup was cooking. I usually do a loving – kindness meditation, but today I decided to go over each step of this process. Seeing myself at the store, chopping and prepping all the veggies and how the liquid moved and bubbled as it boiled. I could almost smell the soup in my mind. Well, actually I could smell the soup and it was just about ready. 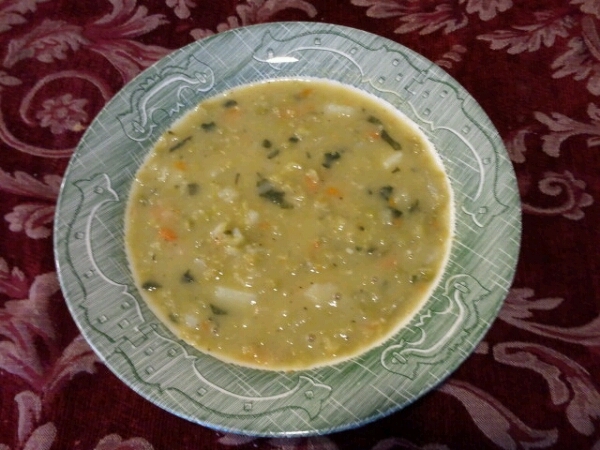 I went down the stairs and opened the lid of the pot; suddenly the room was filled with an even deeper smell of this split pea soup. I prepared my seat at the table, poured a portion of the soup in a bowl and sat down to enjoy. After the first spoonful I stopped and said aloud and all alone, “this is the best damn soup I’ve ever had”. The kitties already think I’m nuts, so no biggie there. After dinner, I did the dishes, folded the clothes from the laundry basket, and got ready to head to bed. I stopped once again to my meditation room and sat for just a few moments. I realized today that my Yoga practice has found its way in to the most simplistic aspects of my life. I ran down the list in my head; I had the intention for the soup, like I set intention for my Asana practice. I was wide awake and present at the store, a place I go to all the time, like how I’m present for my practice. Even if it’s the same Asana I’ve practiced a million times. I enjoyed the process of preparing the dish, just like how I enjoy the process of Asana, going deeper and finding ease and comfort in the pose. I took the time to meditate after the work, the same way I meditate after the work of my Asana. I enjoyed and appreciated every spoonful of soup, the same way I enjoy and appreciate every moment in Savasana. Not only has the practice found its way into these aspect of my life, when I stop and think for just a moment, it has become my life. Union with it all, from soup to loss, from tears to laughter, from fear to love, food gives me life, Yoga gives me life. Yoga gives me peace and clarity, the clarity to see that food is Yoga, and more important, Yoga is food. Where do I go from here? I don’t know, and I don’t care really. I have my practice and it will guide me. I have doubt about that. If I can see my practice in food, I can see my practice in everything I do, maybe the next step is to just continue awareness, and just be. Five years ago Jon plunged head first into Yoga. After establishing a consistent yoga practice he attended and graduated in the first class of the True Nature School of Yoga. After graduation, Jon spent a year in self-reflection and dedicating time to studying the Yoga scriptures. He has a dedicated meditation practice and his teaching style is a blend of movement and meditation, with an emphasis on Mindfulness. Jon attended the Mindfulness-Based Stress Reduction (MBSR) program at the UCSD Center for Mindfulness. 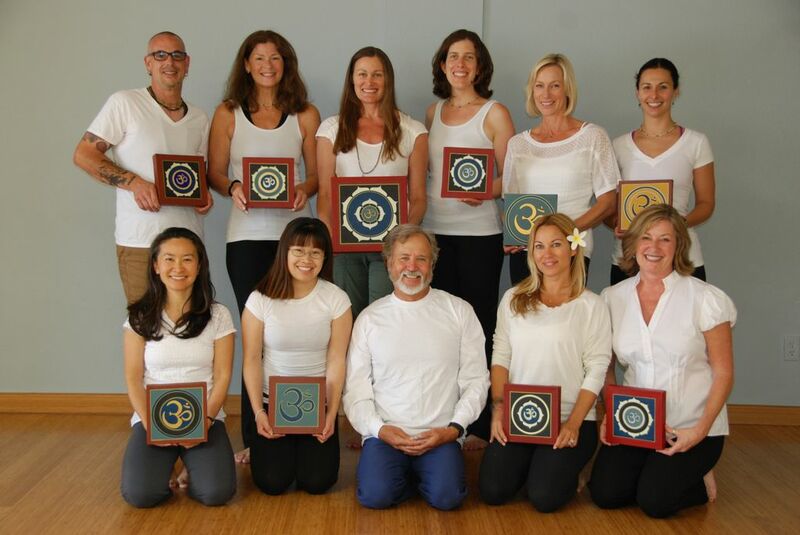 He recently graduated from the True Nature School of Yoga 500 Hour Teacher Training Program. This entry was posted in Blog by stephanieknoxsteiner. Bookmark the permalink.